You can find Cantilever Pallet Rack in Boise at NationWide Shelving and Automated Storage. Cantilever Pallet Rack are designed to organize and protect products and inventory by keeping them off the floor, utilizing the vertical ceiling height, and provide an efficient method of categorizing and storing various products in your warehouse. 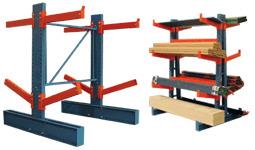 Cantilever Pallet Rack can be built with single or double-sided towers. Examples of both can be seen in the pictures to the left. Cantilever Pallet Rack can be very good use of floor space. You can see storing lumber of long pipes is a natural for this product. If anchored correctly to concrete floors and built with appropriately proportioned columns, arms, and braces, they can be built very tall so as to maximize the use of overhead space which can be considerable in a warehouse. For super heavy duty requirements structural racking is a popular solution. We have what you need. Our business is to weigh your goals, and deliver a system to compliment them. NationWide Shelving 208-284-2559. Light Duty, Standard Duty and heavy Duty Cantilever Pallet Rack, bolted arm connections, pre-punched connection holes, welded columns & bases. NationWide Shelving is a leader in providing steel storage products. That allows us to deliver a product with value quality. Since Nationwide Shelving is a top shelving provider, we are able to keep our prices low, typically beating any price for our products on the market today. Ask your representative for the best value! Boeing, Northrop, BYU, The Church of Jesus Christ and Latter Day Saints, 100's of State and Federal Customers including the FBI, US Attorneys Office, Hill AFB, National Parks Service, Las Vegas Police Department, and US Forest Service. Arms - All arms can be used on either Standard Heavy Duty or Extra Heavy Duty uprights. Brace Sets - All braces can be used on either Standard Heavy Duty or Extra Heavy Duty uprights. Hair Pin Keeper permits instant adjustability of arms. Easily inserted and removed for adjustment of arm height. Cannot be worked loose in service. An efficient way to organize and store long & flat materials. Features exclusive Jarke tapered column design. Constructed for industrial duty strength and safety. Patented internal stiffeners enhances stability. Extra capacity supports up to 6000 lbs. per pair of arms. Available as either single or double sided units -- 8', 10', 12' or 15' height. 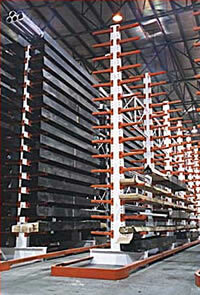 May be assembled as a single stand alone unit or as a complete row of racking. FOB Shipping Point. Easily stores and organizes evenly distributed loads up to 500 lbs. each arm. Arms are 14" and adjust on 1.5" centers and tilt up at approx. 5°. Arm end cap up 2" or flush. To form storage rows, begin with starter unit, join any number of add-ons to complete row. Starter units include 2 columns, arms, and brace set. Add-ons include 1 column, arm and a brace set. Unit height is 7'. Easy to assemble. Gray finish. Sturdy and stable, these heavy-duty Pallet Rack are built for years of rough use.